My heart bleeds for the loss of one who was loved, one who was a protector, and one who was and still is an inspiration to many. May God open his kingdom to an honored one coming home. Prayers for the family. Chad I'll miss you. I enjoyed working with you on the squad. We had some good laughs. You also taught me some things. You were a good investigator and were relentless in catching the thugs. Love you man. Patrolman NLVPD (Ret.) 25 years service. North Las Vegas Police Dpt. It was a pleaser being your friend. Prays for your wife and Children. I'm so sorry to hear of you passing. Please I know you are with St MICHAEL THE ARCHANGEL guard the thown of the Lord and guard your department and your wife and Children. Loss only the 3 of north Las Vegas police . 1995. And 1973 were only the 2 before you. I hurried so many brothers and sister's in blue. You are now a brother who was taken. I call Chief Perez tomorrow. It will be friends and police friend who remind your Children. An your wife will too. I miss you my friend my brother in blue. From a sister in south Louisiana sister in blue. Thank you for your service. Praying for your Family & Dept. Our thoughts and prayers are with you and your family (both at home and in blue) May god be with you and your family through this terrible tragedy. There was a silence all around the throne, where the saints often trod. As Detective Parque waited quietly for the judgment of his god. “Step forward now Detective Parque. You've borne your burdens well. Come walk a beat in heaven's street, you've done your time in hell." 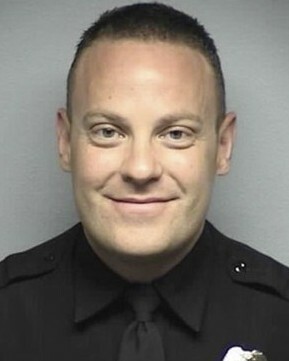 Rest in Peace, Detective Chad Parque. Thank you for your service to this country and your community. My thoughts and prayers are with your family and your department at this time. Rest in peace brother. your spirit will live on forever in the minds and hearts of those in your family, your friends, your colleagues and the citizens of your community that you served with honor. Please accept my deepest sympathies. Losing someone so close to us is very difficult. May all who are touched from this loss read Revelation 21:3-4. It is comforting to know that God will soon remove everything that causes tears of sorrow. Imagine death, pain and suffering being done away with. Only tears of joy when we welcome our loved ones back to a paradise earth. What a joy it will be to experience this promise very soon. Once again, my deepest condolences to the family and friends. Chad I enjoyed working with you on the squad. You were a great investigator and wanted to make a difference to but the criminals behind bars. You also taught me things. Thank you. I miss the laughs in the locker room.. sorry I couldn't have been there to help protect you. RIP Detective Parque and thank you for your service. COCONINO CO. SHERIFF'S OFFICE, FLAGSTAFF, ARIZ.
My and prayers are with you at this most difficult time. Chad my good friend. My heart is broken and my prayers go out to you and your family as well as my brothers and sisters, who are my extended family at the North Las Vegas Police Department. God bless you and your family and keep everybody in the department safe and sound. My heartfelt Condolences to Your Family and Department.Thank You For Your Service.Earth Has No Sorrow That Heaven Cannot Heal. Fly High My Brother In Blue. Your Job Here On Earth is Done. Your sacrifice was far too great. Rest In Peace Brother, thank you for your service. May the good Lord give your family and friends comfort and peace during this difficult time. My condolence goes out to the family and friends of Detective Chad Parque. My sincere condolences to the family and friends of Detective Parque, as well as his brothers and sisters with the North Las Vegas Police Department. Rest in Peace brother. Prayers to your department, family and loved ones. My thoughts and prayers are with you and your family. You are a Hero Detective Parque. Thank you for doing your job. Rest in peace Dear Brother. God bless. "Heroes Live Forever"